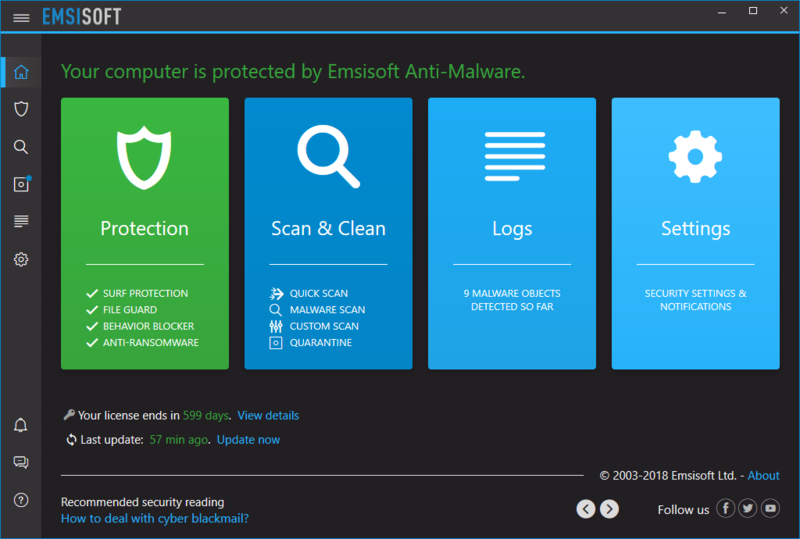 Over the last couple of months, our research and development team has created a new technical foundation for Emsisoft Anti-Malware’s Surf Protection to make it more robust and compatible with the latest changes in common web browsers. Microsoft Edge is now fully supported and we also made some changes to stop Chrome incorrectly flagging our software as incompatible – without making any compromises on the level of protection provided to you. The latest software release also adds a brand new and long-awaited Dark Mode, which changes the whole software to a dark color theme. You might find this new screen contrast gentler on your eyes, particularly if you mostly use your computer at night. It also helps slightly reduce the drain on laptop batteries. To switch to Dark Mode, open the Settings panel and go to the “Advanced” section where you will find “Appearance” which you can change from “Bright” to “Dark”. The post New in 2018.9: Improved Surf Protection and New Dark Mode appeared first on Emsisoft | Security Blog. I hope those Surf Protection tweaks are the tweaks to address Google Chrome. EAM just crashed my Chrome browser once again and I have begun to realize that all the strange freezes and bugs I encounter in Chrome recently are actually due to EAM. I was fortunate that this happened when I wasn't working on something important. This can't continue to happen. You guys need to turn off Surf Protection for Chrome entirely. A mini dump would probably be sufficient. Feel free to send it to me directly: fw@emsisoft.com. I am currently moving to a different country, so my reply may be a bit delayed but I will look into it as soon as I can.